Well, it’s lupine season again at Sugar Hill in New Hampshire which means the beginning of the Lupine Festival. Last year was my rookie year as a landscape photographer looking to capture this charming New England event, so I ended up with a load of ticks making my acquaintance after being in the lupine fields. This year I was equipped with permethrin treated clothes to repel the bugs and a hat which made me look like the guy from the Curious George books. They work though. The trick is remembering to always wear them. The only time I got close to the lupines without the special clothes (briefly) I had 2 ticks attach themselves. Denim is like a tick-catcher. Beware! Anyway, the weather was sunny but the sunrises and sunsets didn’t play ball so there was no glorious sky over the 4 days I was there. There was, however, a clear sky with an early sunset which meant one thing. I haven’t done too much night photography except in Death Valley a couple of years ago but things were looking good for this trip. While I was in the field of lupines overlooking St Matthews church I started talking to a fellow photographer and she gave me a suggestion for a lake location nearby which looked great. I set off to scope out the spot and it looked great, even with day shots. I needed to return with something a little more adventurous. To get a natural looking shot I was going to have to get a couple of exposures which I could blend later. An early one around sunset when I could get a foreground shot of the lupines which was in focus and not noisy and a later one to capture the Milky Way. I also tried light-painting but the results are inferior due to uneven lighting and motion blur. I arrived before sunset (8ish) and took a series of shots at different apertures and speeds (24mm/1.4 Samyang lens) as the light decreased, knowing I could later choose the best one. Then it was time to chill and watch the fireflies, listen to the wildlife, hope for no bears and wait for the show. The night was cold and very clear with so many stars. Breathtaking! 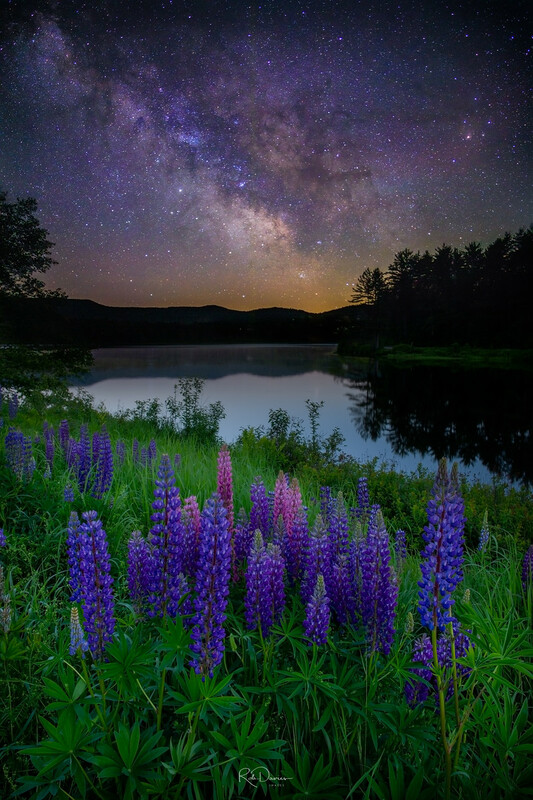 As the darkness descended (full-dark as Steven King calls it) the Milky Way started to rise over the lupines. Around then another car pulled up and two women got out, a little dismayed that I had taken the same spot they had scoped out earlier. We chatted and tried to make it work out. I was amazed anyone else would be in such a remote spot. One thing you can’t do if you plan to blend shots is move the camera, so I was set for the night. I achieved adequate focus for the Milky Way by focusing on a light across the lake earlier in the night (equivalent to infinity, it worked really well). For the Milky Way shots I shot with a variety of speeds and ISO settings to get the least noise and best focus (i.e lowest ISO, fastest speed). The galaxy was looking the best for the composition around 11.30 with an ISO of 1600 and 13 seconds. I stayed past that as it is hard to leave such a scene but I needed some sleep so I packed up and hoped I had what I needed to get an image with both the lupines and the Milky Way looking properly exposed and natural. I (and my wife) was happy with the final result. I hope you like it. Thank you for sharing I no longer can get out into the fields as much as I would love ! I grew up in a family of hunting and fishing guides and camp cooks. So nature in her best is always my heart!